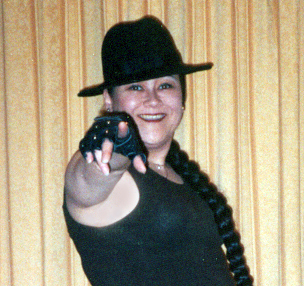 Andrea J Chee 1966 - 2008 R.I.P. This homepage is always under construction, changing slowly but surely. In the summer of 1996, I received my BA Hons History at the University of Kent at Canterbury. My area of interest is Anglo-Saxon Paleopathology and Cemeteries, and I also did a year of postgraduate research on the subject. For a time, I found myself in the curious position of teaching Computing at the University. Not bad for an historian! I am now a freelance journalist, copy-editor, editor and reviewer. I review DVDs for Movie Gazette, where I am known as their "most leather-clad reviewer". I have a particular interest in sci-fi, horror, and cult films - there's nothing like a B movie to keep me happy! My favourite films include: Kevin Costner's oft-overlooked but exceptional Waterworld, the astonishing work Peter Jackson has done on The Lord of the Rings, Lucas's wonderful Star Wars mythology, and the ultimate zombie film Dawn of the Dead. Amongst other things I've also edited The Kennel Gazette for The Kennel Club and Dog World. Along the way, I have written on such diverse subjects as pets and animals, human resources, business, technology (including IT and communications), and even Used and Refurbished Confectionery Manufacturing and Packaging Equipment - so email me if you need a professional writer or editor, but don't expect freebies for your homepage/ezine because I do this for a living. I enjoy dog showing, riding, rifle shooting, watching films, acting, computing, cars and doing the unexpected. I'm a phsycial actress - I like fights, chases, stunts and similar, and am best suited to strong, unconventional roles, although I also adore doing classical theatre and dancing on stage. I welcome approaches from all amateur/independent/pro-am/pro film and stage directors - in particular offer me the chance to learn more weapons, try a big fall, or bring anime style to live-action and I'll find it hard to say no - I like to scare myself! I love a good laugh, and run The Loony Bin - a humour mailing list, which is also archived. Feel free to stop in anytime to read the jokes. You may also wish to visit my History pages at Bloodaxe's History Links and if you have any comments to make, you're welcome to mail me. I am a member in good(ish) standing of the Goddesses of the Internet, and of the Blackpalfrey Motor Club of Kent. I am also Chairman of the Steering Committee of a charity called PetAid. I have a particular interest in Symmetrical Lupoid Onychodystrophy - an autoimmune disease which makes dogs' claws fall off. I run a mailing list for owners of dogs with this disorder, and for interested veterinarians. For more information on SLO and the list, follow the above link. This page is created and maintained by Andrea J Chee. None of my pages would exist without P.J.Wise. Thanks Pete!